Experimental 51864+ will have...experimental...i/O optimizations. Please test. The next build on Experimental (51864+) will include some new I/O optimizations. If you are running the game on a traditional mechanical spinning HardDrive especially, please give it a shot. It may help quite a lot, it might not help at all. We need to find out if there are any improvements. Specifically, make sure you're on the Experimental Steam beta branch, then look at the top right of your screen and make sure your number is 51864 and above. It's just being deployed to steam as I type so should arrive in about 40 mins from this post. We need as much feedback from as many types of systems. Specifically, if you notice any improvement with hitching moving around the world, loading objects/creatures/terrain etc. I just now switched to Experimental branch, updated the game and started a new save file (making sure to delete the old one). I'm eager to test and see any changes and improvements (LOVE the new PDA bootup, btw) but the HUD icons somehow "clip" through physical elements of the Lifepod? It also causes some weird issues during the intro sequence and playing the game. I realize this has minimal to do with performance and will be fixed soon, but I'll be honest - if not for testing the game I couldn't play it with such weird graphical oddities otherwise. This shot happens during the opening sequence. It stays this way for about ten seconds, and doesn't advance until the survivor slides down the ladder. This shot happens shortly after the panel comes off, something clips in front of the survivor and pixellates the vision. This one is hard to capture as F12 won't work for some reason during this event, but when the survivor wakes up later the pixellation from the previous event remains and distorts the screen until you stand up. Now the game looks great but there's a HUGE issue - the HUD now clips through solid objects! Here you see the depth gauge clip through the opposite seat's restraining arm. Here's a shot of the lower HUD health and quickbar displays, which now clip through the opposite seat. Notice the pixellation that the shearing produces. Again, I know this is a hiccup to an otherwise larger problem and as so far does not impact what we're trying to test. But I had to post this since this is the first severe video issue I've come across in Subnautica ever, and my game has always looked great regardless of the build. (And as I've mentioned above, I honestly can't play the game with such weird graphics issues as this, regardless of how little it might appear in game). EDIT: Nope, I take it back... I can't play it in this state honestly. After finally getting back to the game and exiting the Lifepod (love the new animation btw!) THIS happens... 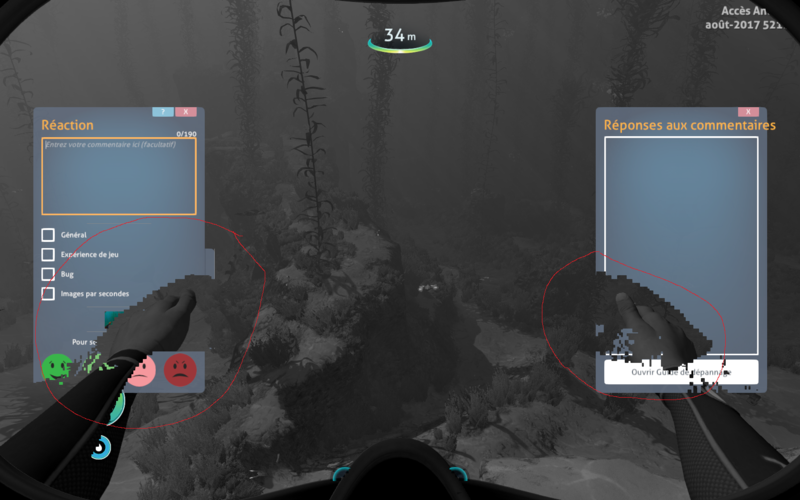 The player's arm movement animations constantly wipe the HUD's graphics away - including the watermark at the top! And the goggles visual effect permanently disrupts the Quickbar as well. I'll keep testing for the sake of the devs, and will report my findings as I play on a physical hard drive, but I'm going back to Stable as soon as I possibly can... sorry @Obraxis if my post isn't very helpful right now. I've often had performance issues with certain areas of the game. Will switch to experimental when I am off work and give some feedback as I am not using an SSD so I should be a good candidate. @Obraxis Do you want system specs included with feedback? Thanks! So far, most of the problems I've been having have been addressed. The game is performing better than it has in a long time for me. I was able to go to the mushroom forest, which the flora still pops in, but it's very very quick to load than previously before. I can still see the edges of where the flora on the ground is per each cell, but loads in quickly after reaching the distance threshold. Still getting slight freezes time to time, but rather than freezing for 15 seconds, it's more like 1-2 seconds, and happens much less frequently. There are some graphical issues I've noticed, such as smoke from vents being visible in the Cyclops, as well as overlaying over my UI while piloting the Cyclops, as well as the lights being visible while sleeping (eyes shutting) in bed. The structures from the Aurora still slightly pop in for me, but again, very very quick to load otherwise. Loading my save does take a long time however. It doesn't immediately go to the load screen, rather, it locks up for a few minutes before the loading screen comes along. This never used to happen. Also, did you guys intentionally remove the thermometer? I notice the UI for crafting is much better, just curious if it was intentionally removed. All in all, whatever you guys are doing, it's working very well. I can safely say this is the most stable Subnautica has ever been running on my system. I give my seal of approval. Okay so! I have more accurate and important news to report this time. Despite my earlier misgivings with the game and the issues with the HUD graphics, I am very pleased to report that there are far fewer hangups happening between moving in the game. A few months before, I had to move Subnautica to a secondary hard drive (which is also mechanical) that was seperate from my OS - apparently the drive accessing both the game and the OS at once caused a lot of lag from just playing the game, and sometimes would hang up when trying to load up areas or assets. And I know, I'm only running 4GB of memory (that alone is pretty taxing of a system) but the game originally ran flawlessly a year ago. Now as I stroll about leisurely on the surface of the ocean or underwater, there is very few events of these issues happening. Popup occurs less frequently, and transitions between biomes appear to be seamless. So far I've only encountered one issue of popup when a Large Wreck in the Blood Kelp zone suddenly appeared with some minor lag, but even going around the Aurora and the Crash Zone has not yielded any problems. I can tell that the hard drive LED indicator doesn't light up as often as before, and overall the game seems to be running much sweeter! EDIT: I decided to test the limits and patrol around the Mushroom Forest, which in the past has caused a number of performance issues for majority of players in the past. While I can say the FPS runs slower there than the rest of the game still... there is a signigicant improvement in the gameplay overall! There's fewer hiccups and again the game doesn't bog down like it did in the past. Kudos, dev team! Whatever you guys are doing in the game keep it up! I can already tell a better performance than in the past six months - I know you guys will strive to get things working better and better! And again, sorry for the previous post... I kinda overreacted to the distortion issue. I'll stay on Experimental mode and ignore the other issues, since you guys will be pushing more updates to it over the next few days and such. Thanks again for all of your work! You guys rock! Medium resolution is okay but still few lags when loading the map. @Tarkannen the graphical issues you're having are known, and due to an Nvidia driver update that messes up stuff. We've let Nvidia know, but we've heard nothing back yet. Glad to hear the experimental update seems to be helping people so far. Just updating now and hoping that it's as good as people are saying I've not had the issues @Tarkannen has had and I'm running Nvidia. EDIT: OK I'm running a GTX 1070 so I have everything maxed out. It's running much more smoothly, a few minutes driving around fast and no big freezes like before, although it may be too soon to tell. However I am still getting some pop-up, not as bad as before but the wreck in the Grassy Plateaus to the NE popped up 50m in front of me both on my way to the Mountain Island and on the way back - I saw a couple of patches of shimmering light and then *pop* there's the wreck. I had to go to work today, but upon returning I decided to investigate my issues. Based on what @Obraxis said, I decided to try rolling back my drivers from the most current ones, to a set that had previously worked in the past. My current system has an nVidia GeFore 650ti, and was running ver. 384.94 (Jul 24 2017). I uninstalled it and loaded 382.33 (May 22 2017) and rebooted the system. (I see they have a beta 385.12 (Jul 31 2017) but I'm not keen to try it yet.) When loading Subnautica Experimental again, there was an update: I'm now on Aug-27 51925 version... I don't know if the issue was fixed from the older 51864 build or the 382.33 driver... but CHECK IT OUT NOW! My game has returned to me! No more pixellation, no more tearing! No more weird hallucinations, nor broken bits of HUD that flush on the whims of floating point decimals! I, once again, can play - nay, can ENJOY! - the world of 4546B! I can take in all of the wonders of the world and not be subjected to trippy visual artifacts of the screen. My love for this game has once again become mended, and I can enjoy its splendor once more. I'll likely upgrade the video drivers once the new Stable update has hit, but for now I'll keep things as they are. In the meantime if it was a change to the game's engine instead of the driver, KUDOS to whoever contributed to the 51925 build! I'm sooo happy I can play the game without getting frustrated at my broken HUD. You developers at UWE, keep up the fight! We're all in this together! As I said @Tarkannen - it's an Nvidia driver issue, we've not done anything to break or fix UI glitches. Please try and see if your hitching has reduced (especially using the seamoth) in the latest Experimental build. Minor update here - I've been playing since yesterday and am reporting in on performance status. So far the game is running *really* well still. I'm approximately 20 gamedays in and so far everything is running great. I just recently crafted the Seaglide and Seamoth, and have been running around the world stress-testing areas. * Running at top-speed across the surface yielded no lag. I know this may seem counter-intuitive, but with only 4GB of system memory, I would lag when crossing biomes even when nothing changed in my visual range (as I presumed assets and such had to load around me). * Speaking of the Wreck, I swam around it and inside it, and was pleased to find I couldn't notice any hitching or hiccups when going in and out of the access tubes. Everything there looks to be fine with me. * I stumbled across the Underwater Islands by chance early on, and decided to roam about the area there. I was delighted to find Diamonds there (and chuckled when the PDA announced our debt is far more painful now than before) but also Stasis Rifle Fragments! I usually only found one total on the Floating Island near the base, and that sadly wasn't always 100% chance to find. As for performance, swimming around the Bonesharks and terrain didn't seem to cause any issues, and I didn't have any problems when going deep and exploring the trenches and caves. * I decided to travel into the Grand Reef and Deep Grand Reef and test out the performance there (caveat: I had to turn on NODAMAGE cheat, as at this point my Seamoth has just the Mark I Pressure Compensator). I've never had much issue with the Grand Reef, and I do like how it's easier to navigate now with the fog change. The Grand Reef performs well enough when travelling around at Seamoth speeds, and for the most part runs as well as before. However, there are still hitching issues when travelling around the Deep Grand Reef at Seamoth speeds. It's likely a similar issue with the Mushroom Forest, where the FPS takes a hit due to having to draw all of the terrain and assets and keep them loaded in memory. But I should point out that the zone still performs better than it had for me in the past. * As a final thing, I decided to travel into the Void and check out the changes there. I must say I was pleasantly surprised to see the threat added to the Void, and I promptly died after my Seamoth was sacked and I was devoured whole by the threat. The design and sound are superb... my only suggestion is that when it spawns in the Void and is tracking you down, perhaps add some creepy/disturbing music to play to let you know you're doomed? Maybe Simon could add just a touch of desperation to the encounter. All in all, I'm still pleased with the changes. The game is running much tighter and smoother now, and performance is closser to when I started playing back in July 2016. I'm happy to see the game working better, and also that my personal issue with the game was with nVidia itself and not something within the game. (Thanks, @Obraxis!) Keep on being awesome, devs! - There's a drop-down menu called "Select the beta you would like to opt into:"
Apparently I have a super-fast connection because the download took less than 10 minutes for me. My computer is modest in terms of power, so it'll be interesting to see how it plays now. p.s. Thanks to @Tarkannen for the super-detailed gameplay reports! The new performance stuff is great! I'm having nearly no lag stutters. carte graphique GTX 1050 TI G1 4G ( non overclocker ) carte graphique réglage usine ! Graphics card GTX 1050 TI G1 4G (not overclocker) graphics card factory setting! 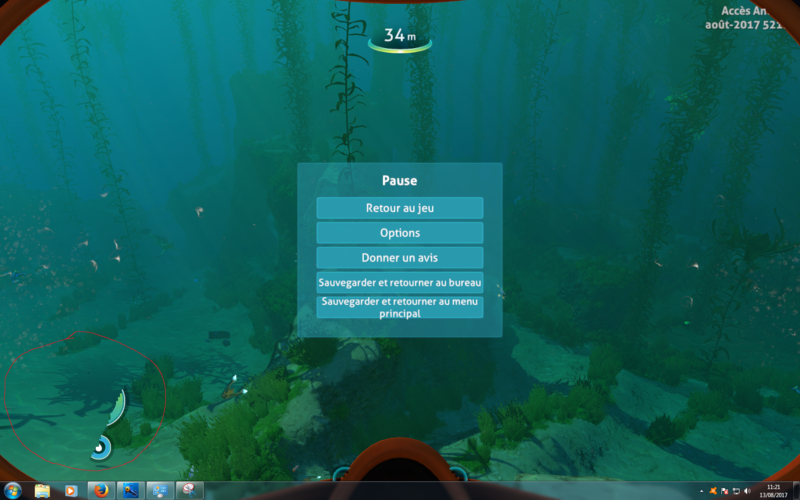 je trouve le jeux un peux plus fluide reste encore des lags ! I find the game a bit more fluid still lags still! The graphical issues you're having are known, and due to an Nvidia driver update that messes up stuff. We've let Nvidia know, but we've heard nothing back yet. Les problèmes graphiques que vous rencontrez sont connus; Ils sont dus à une mise à jour du pilote Nvidia qui gâche des choses. Nous avons laissé Nvidia savoir, mais nous n'avons pas encore entendu parler de leur part. Game is installed on standard 1TB HDD, though i tried installing the game via iSCSI to my home server, and my network managed to keep up streaming the game terrain data flawlessy, even over wifi. And I see I have Nvidia drivers 382.33. I will avoid upgrading to 384.94. Thanks! The next update will have a workaround for noVideo's error. Game settings: 1366x768 resolution, recommended graphics, medium water. The game still has pop-in-- about as much as before, but the framerate seems smoother. I can't say for certain that it IS smoother because I'm not running benchmarks on this rig, but it feels like the FPS have definitely increased. The Mushroom Forest will probably always have pop-in for me, but where the pop-in used to be fairly quickly-but-sequentially, now it happens fairly quickly in big chunks. Bottom line: Whatever y'all are doing, it's working to improve the experience. I'll let you know if running at 1080p is possible. Unrelated, but I hate hate hate hate hate the way the Seamoth handles now. We've now also added to Experimental a work-around fix for all Nvidia driver issues & VR visual UI/Water surface glitches. Nvidia put out an updated driver (385.28) on 8/13 (Sunday). It might fix the problem, but I'm not on Experimental so I can't say for sure. I think you misunderstand me-- I'm fine with the way the game runs; the only thing I'm complaining about is the Seamoth's new handling (seriously, why does it do that??). Feedback from spinny HDs was requested though, so I gave it. I'm fine with some pop-in (except where Reapers are concerned, but that is extremely rare for me). What's the change with the Seamoth? No it doesnt. We've made a work-around fix ourselves. Ahh..., well I guess it's not likely then that they will do anything about it till the game is officially released. While moving, whenever you turn in a new direction, it tries to go back in the previous direction for about a second before giving up.